Some people might not know but Max Payne is actually based on a 2001 video game with the same moniker. 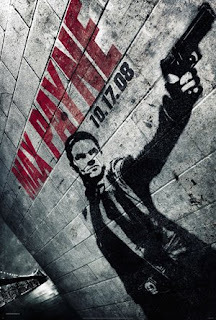 Max Payne the game became famous due to its "bullet time" system. Think of it as the slow-mo scenes in The Matrix movies. As the plot of the movie goes too, some of it are actually inspired by the game albeit the story line was different in most cases. Honestly, we do not expect much from Max Payne as the golden rule goes that video games and movies don't mix; they just make ugly films and ugly games. Can Max Payne break this Gold Rule that many have sought before to break yet failed? Max Payne's main plot is about his struggles in recovering and in trying to move on on the murder of his beautiful wife and daughter. Max goes home one afternoon and discovers that their house was broken into. He quickly goes upstairs and shoots and kills the robbers/murderers but unfortunately one managed to escape. He was only a few minutes late before he could save his wife. Max, now moving himself from the Police Force to the DEA is still obsessed in finding the lone killer of his wife and daughter. When he is the prime suspect on the murders of Natasha Sax and his former partner Alex Balder, Max Payne discovers that the reason for the murder of his wife and daughter might be more complicated than what he he first thought. Max Payne is a huge bomb, but not in a good way. It just failed in everything. From the very predictable and very conventionable plot to the cheap feeling that it brought on us for its design, effects and cinematography. In our opinion, games and movies just don't mix because they are different experiences for the people watching or playing them. As for games, they can escape corny and shallow plots (because gameplay is much more important than the plot) but for movies they can't. The game truly inspired this one and it killed it. As for the cinematography, it just felt like that the movie was just trying so hard to capture the dark, gritty feeling of the game to the point that it was too much. Think of this as a cheap man's Sin City and you'll understand what we are talking about. Mark Wahlberg was lackluster in this one and hopefully his trend from The Happening won't be the start of something disastrous for his career. In the end, Max Payne is just a pain to watch. Fans of the game series and newcomers alike will dislike this one.